Showing items in category Abu Dhabi, sorted by newest listed first. 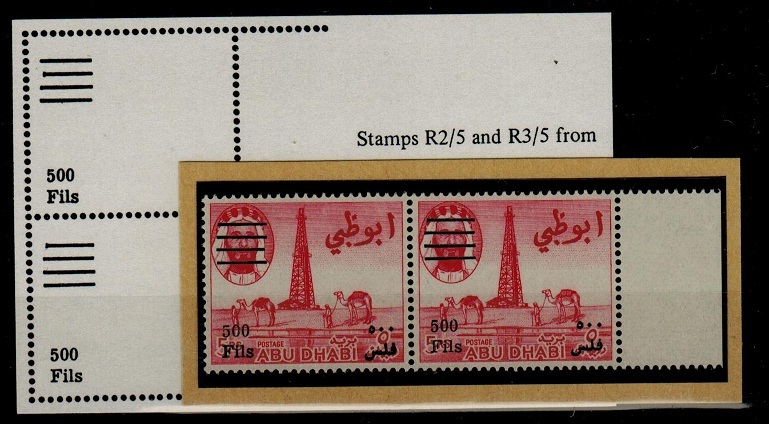 ABU DHABI - 1965 40np rate cover to UK used at DAS ISLAND. 1965 (JU.5.) 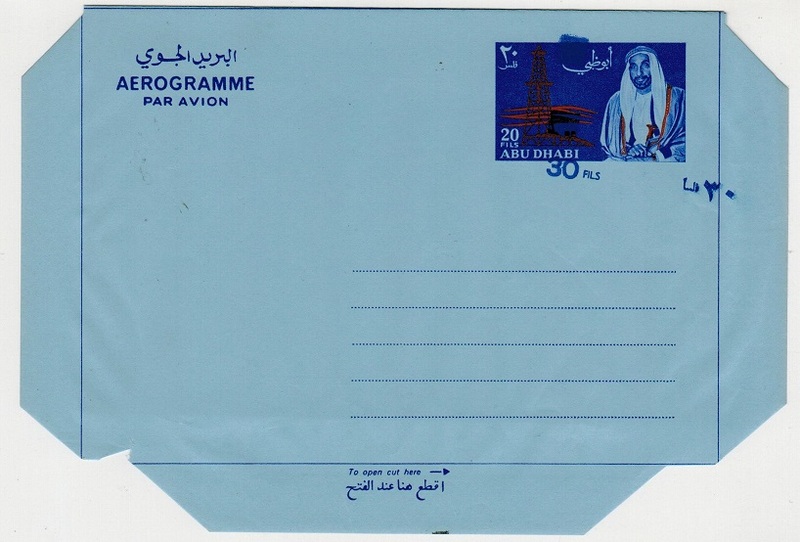 cover addressed to UK bearing 40np adhesive tied DAS ISLAND 1/ABU DHABI TRUCIAL STATES cds. 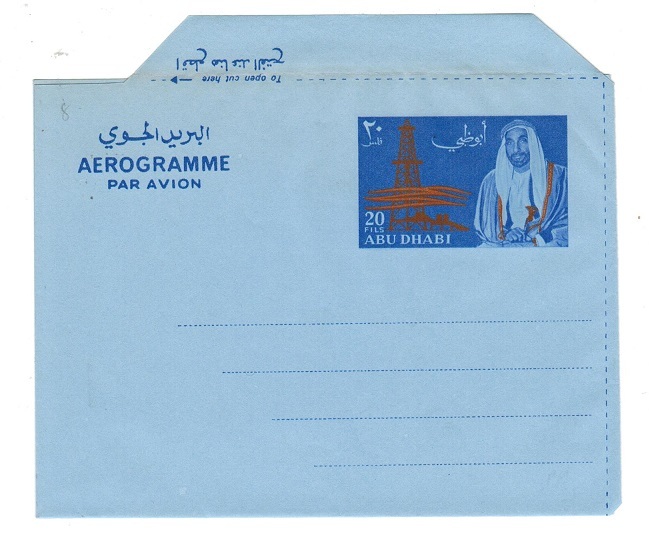 ABU DHABI - 1971 30f on 20f unused aerogramme with SURCHARGE MISPLACEMENT. H&G FG12. 1971 30 fils on 20 fils 'Oil Rig' aerogramme in fine unused condition showing the major error SURCHARGE MISPLACED TO LOWER RIGHT. (T.E.Jones type ADL 11c). H&G FG12. 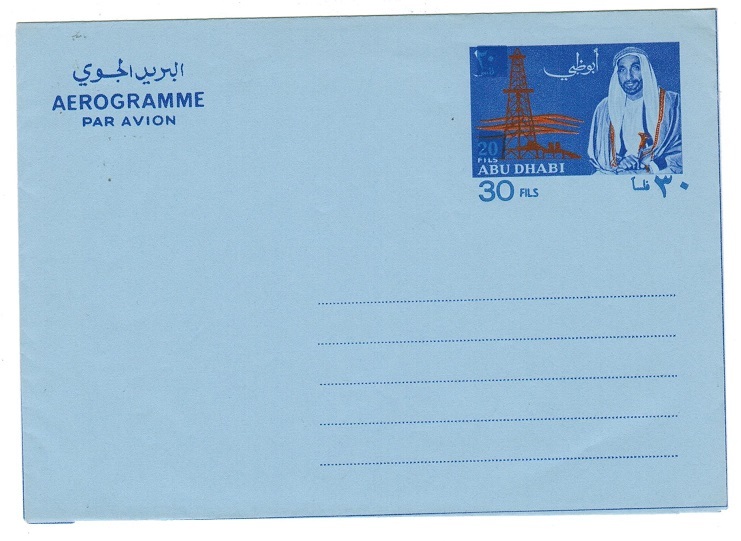 ABU DHABI - 1969 25f on 15f provisional adhesive on cover to UK used at ABY DHABI. 1969 (DE.18.) 25f on 15f brown and red on white provisional adhesive tied to cover to UK by ABU DHABI/TRUCIAL STATES cds with additional strike at left. Exceedingly scarce on cover. This provisional being issued on December 13th. ABU DHABI - 1971 30f on 20f unused aerogramme with MISPLACED SURCHARGE. H&G FG12. 1971 30fils on 20fils surcharge in blue unused aerogramme showing the major error SURCHARGE GROSSLY MISPLACED. (10mm shift). H&G FG12. 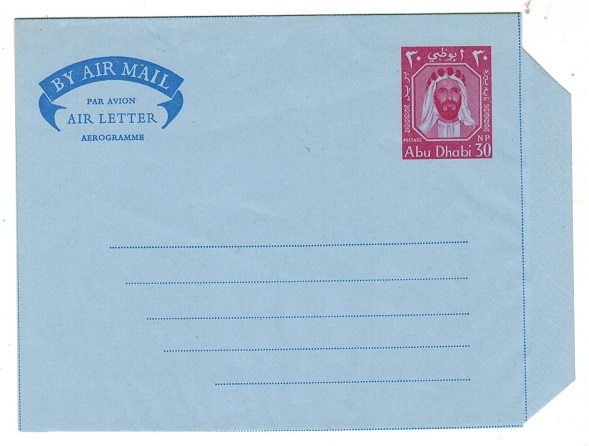 ABU DHABI - 1964 30np carmine air letter unused. H&G 1. 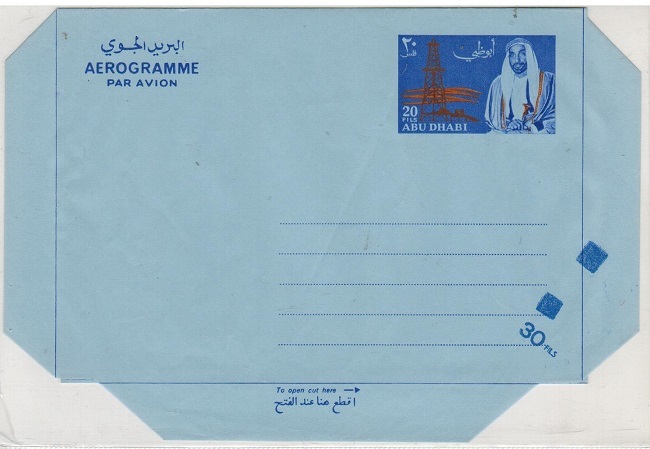 1964 30np carmine on light blue postal stationery air letter in fine unused condition depicting 'Sheik Shakbut Bin Sultan. H&G 1. BR.P.O.IN E.A. 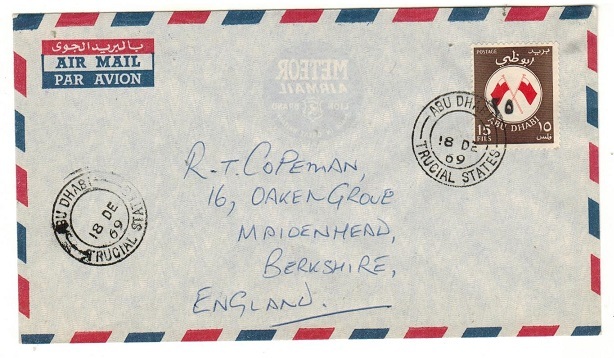 (Abu Dhabi) - 1963 DAS ISLAND cover addressed to UK. 1963 (NO.3.) 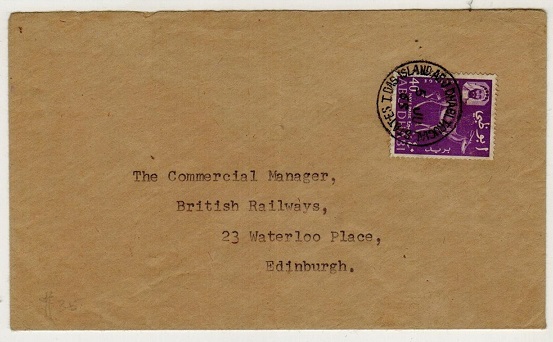 cover addressed to UK (central fold-opened on 2 sides) bearing 40np on 6d Br.P.O.in Eastern Arabia adhesive (SG 88) tied by DAS ISLAND/ABU DHABI TRUCIAL STATES 2 s/r cds. ABU DHABI - 1970 20 fils 'Oil Rig' unused aerogramme. 1970 20 fils 'Oil Rig' aerogramme in fine unused condition. (T.E.Jones type ADL7). ABU DHABI - 1971 30f on 20f unused aerogramme. ABU DHABI - 1969 60f rate cover to UK used at DAS ISLAND. 1969 (MY.24.) 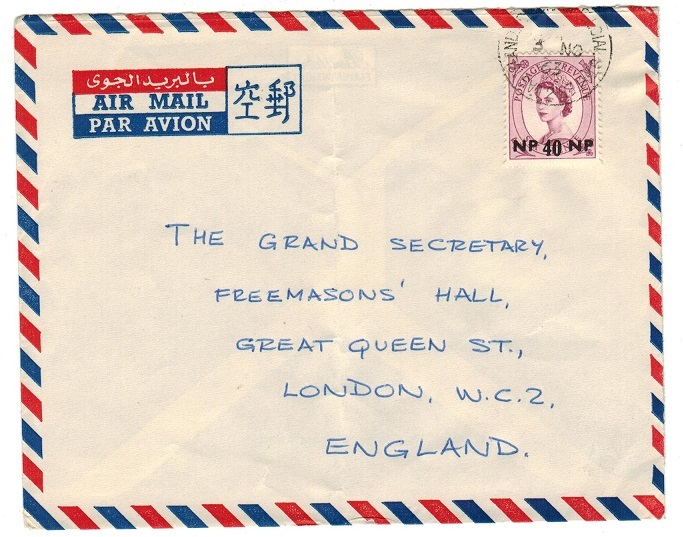 long airmail envelope addressed to UK bearing 60f adhesive tied by DAS ISLAND ABU DHABI.TRUCIAL STATES/1 cds. 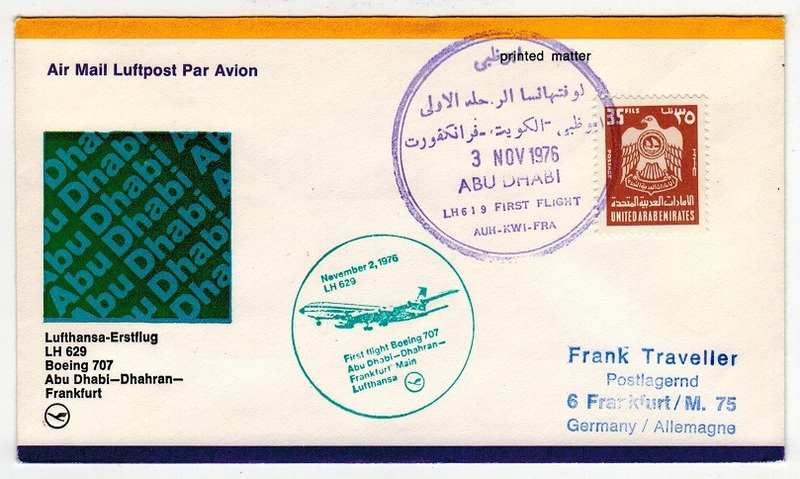 ABU DHABI - 1976 first flight cover to Germany. 1976 (NOV.3.) first flight cover addressed to Germany bearing 35f adhesive tied by violet ABU DHABI/LH6 1 9/ FIRST FLIGHT/AUK-KWI-FRA cancels. Lufthansa-Erstflug L629/ Boeing 707 flight from Abu Dhabi to Frankfurt via Dhahran. 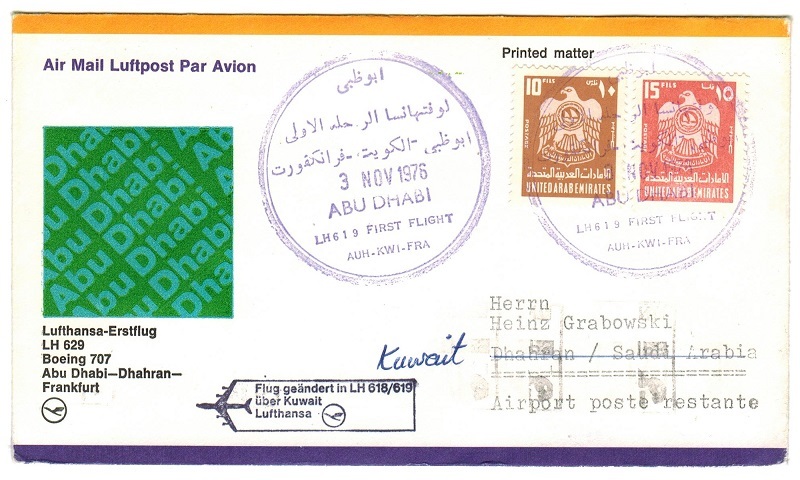 ABU DHABI - 1976 first flight cover to Saudi Arabia. 1976 (MAY.5.) first flight cover addressed to Saudi Arabia bearing 10f and 15f adhesives tied by DUBAI U.A.E. roller strike and with violet boxed LUFTHANSA FIRST FLIGHT cachet applied alongside. Lufthansa-Erstflu LH629, Boeing 707 flight. ABU DHABI - 1976 (MY.4.) first flight cover to Germany. 1976 (MAY.4.) 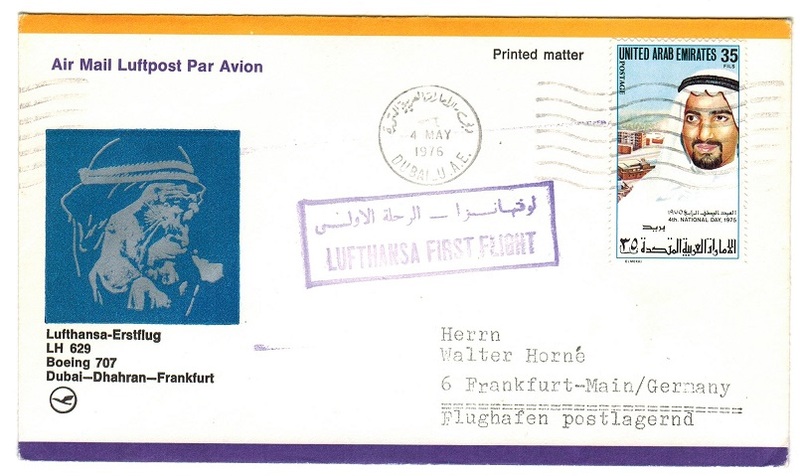 first flight cover addressed to Germany bearing 35f adhesive tied by DUBAI-U.A.E. roller cds with violet boxed LUFTHANSA FIRST FLIGHT cachet applied. Lufthansa-Erstflug LH 629/Boeing 707 flight. ABU DHABI - 1976 (NOV.3.) 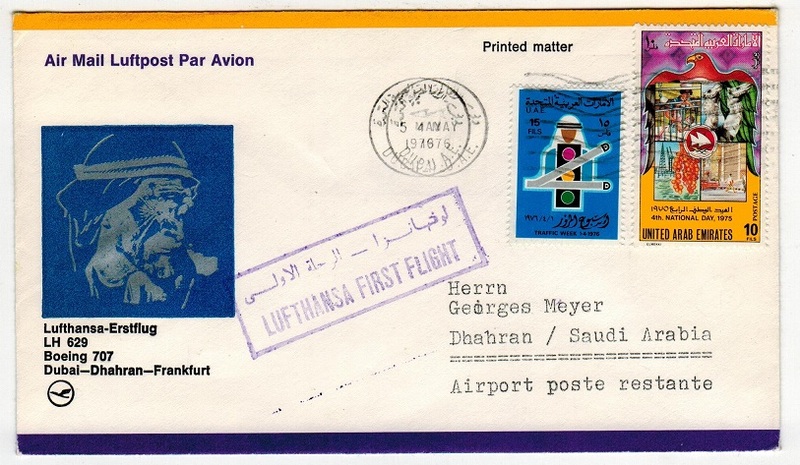 first flight cover to Saudi Arabia. 1976 (NOV.3.) first flight cover addressed to Saudi Arabia bearing 10f and 15f adhesives tied by violet ABU DHABI/LH6 1 9/ FIRST FLIGHT/AUK-KWI-FRA cancels. Lufthansa-Erstflug L629/ Boeing 707 flight from Abu Dhabi to Frankfurt via Dhahran. BR.P.O.IN E.A. (Abu Dhabi) - 1966 'QSL' radio card. 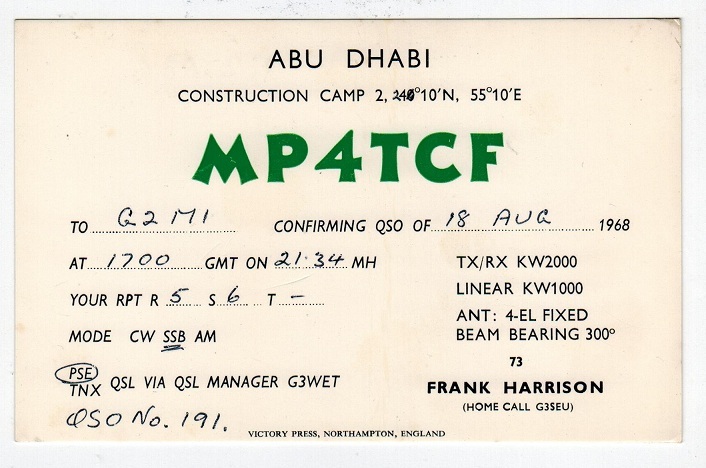 1968 MP4TCF Abu Dhabi Construction Camp `QSL' radio card confirming radio reception. Used but originally sent under separate cover. No postal markings. BR.P.O.IN E.A. (Abu Dhabi) - 1966 500f on 5r U/M pair with SHORT CLUBBED BAR variety. SG 24. 1966 500f on 5r Carmine-red. A superb unmounted mint marginal block of four showing the SHORT CLUBBED BAR variety on both Row 2/5 and Row 3/5. SG24.